I am often asked where I find birds to photograph. I have spent a number of years traveling, and documenting the birds I see. I have notes that I refer to every year, that lists where a certain species of bird is most likely to be found, and the time of year to look for them. One of my favorite places to go in the winter is the Skagit Valley, either into the mountains or out onto the flood plains (the flats). The amount of migratory bird life in incredible. Through the months of December to April, thousands of Snow Geese remain in the Skagit Valley. They feed on the winter cover crops that are planted by the farmers. The pristine farmland becomes covered with these large flocks, and give photo opportunities to professional and amateur photographers. Along with the Snow Geese are Tundra and Mute Swans. All three of these species migrate down from the arctic for the winter. The summer months are spent raising young, in the short arctic summer. Other birds that may be seen in the winter are Snowy Owls (depending on their food supply), Short Earred Owls, Northern Harriers, Red-tailed Hawks, Sand Pipers, Great Blue Heron and more. Through-out the area, bald eagles migrate down from Alaska and British Columbia for the salmon runs on the Skagit River. These beautiful birds can be seen in large number in the mountains along Highway 20, and other roads along the river. 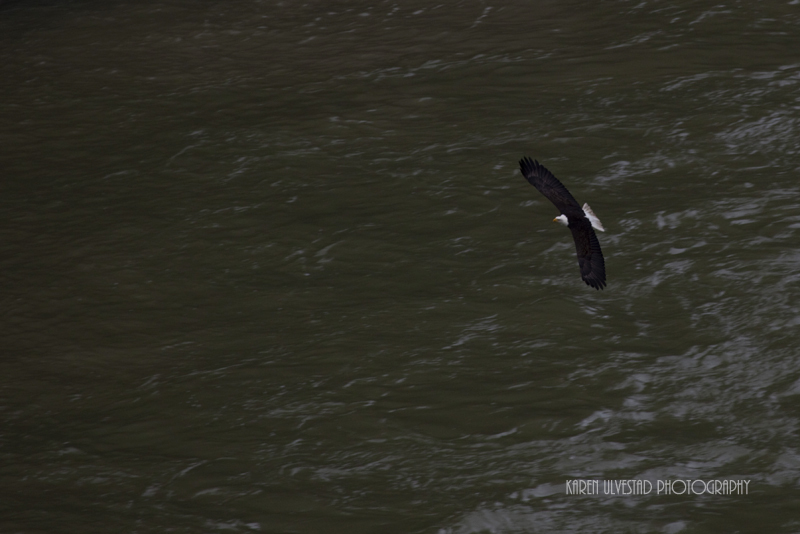 Also, the eagles can be found closer to Puget Sound in the Skagit flats. This past weekend, we discovered an area along the river by the small town of Concrete with 15-20 eagles at a time. There were both mature and immature eagles roosting in the trees, and flying over the river hunting salmon. The eagles usually start leaving, and returning North in February. . .